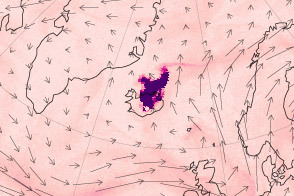 After covering a large portion of Iceland with ash in late May 2011, Grímsvötn Volcano left behind a small lake filled with melt water and a hole in the Vatnajökull Glacier. 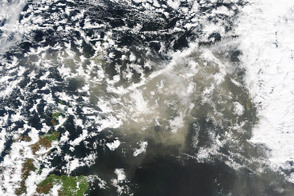 This natural-color satellite image was acquired by the Advanced Land Imager (ALI) aboard Earth Observing-1 (EO-1) on June 11, 2011. The lake covers much of the site of the eruption, with the possible exception of the crescent-shaped feature along the southern shore of the lake. This may be a tephra cone left behind by the eruption. Gray ash covers the ice of Vatnajökull Glacier near the vent. Further away, the ash layer itself is obscured by snow. 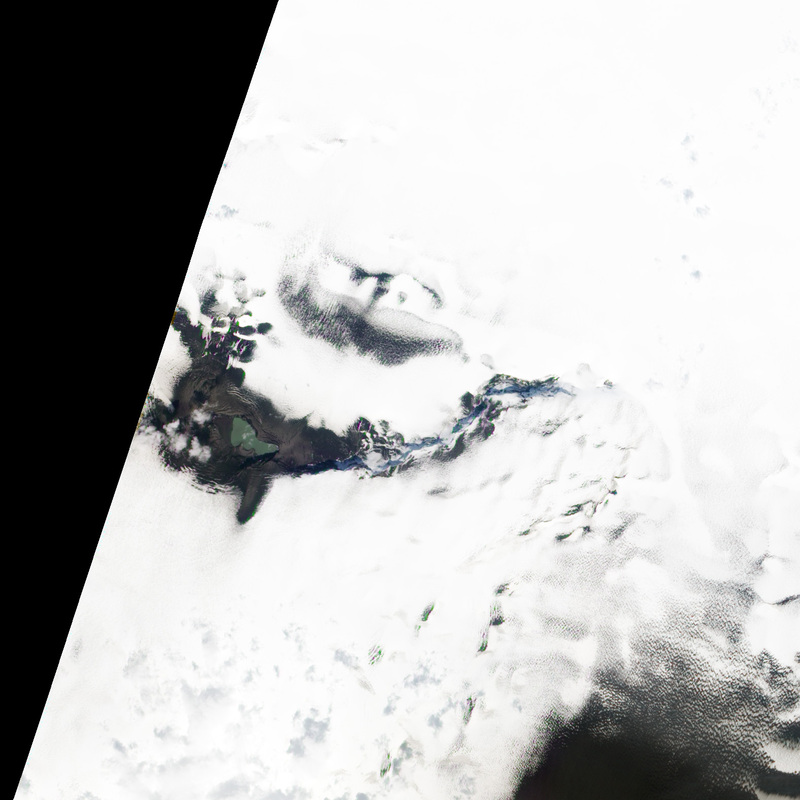 NASA Earth Observatory image by Jesse Allen and Robert Simmon, using EO-1 ALI data. Caption by Robert Simmon. 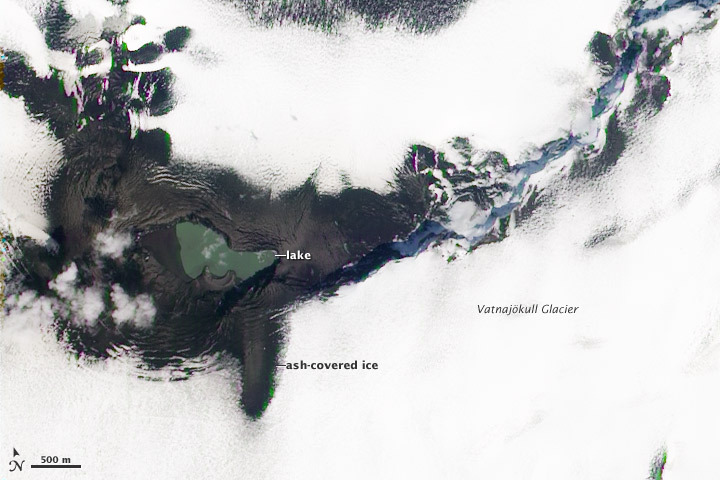 After covering a large portion of Iceland with ash in late May 2011, Grímsvötn Volcano left behind a small lake filled with meltwater and a hole in the Vatnajökull Glacier. 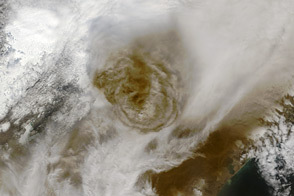 On May 21, 2011, Iceland’s Grímsvötn Volcano erupted, sending an ash plume 20 kilometers (12 miles) high. 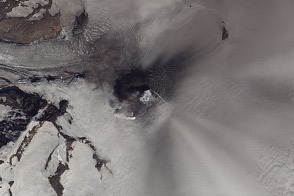 The eruption had subsided by May 26th. Institute of Earth Sciences. (2011). 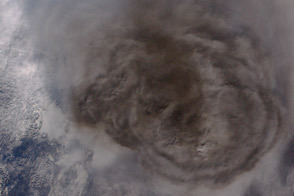 Eruption in Grímsvötn 2011. Accessed June 22, 2011.